« Day 151 in Beijing: The Summer Palace, Part 2. 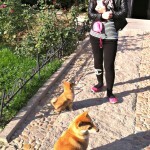 Day 152 in Beijing: Mama, Puppy and their Human. Jill and I were looking out the window of our apartment a few days ago. 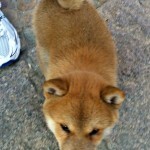 We saw this super cute puppy and the mother. It’s human was walking hanging around as the puppy explored and the mother watched and made sure the puppy didn’t get too far away or in too much trouble. A few days later, we say them again and had to meet them. We walked outside and asked the human if we could take some pictures and pet the puppy. The human nodded yes and we slowly petted the puppy as the mother watched somewhat curiously and very much protectively. As you can see, the mother had no interest in being petted by us. The puppy loved it and just wanted to cuddle and play. One of best parts of Beijing are the dogs and the humans that take care of them. They are treated incredibly well and seem to be very happy and friendly. I’ve yet to see dogs fight or attack each other. 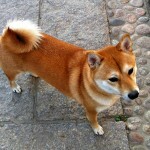 Most seemed well trained and are very cute and kind. 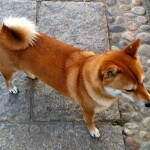 This breed, by the way, is a Shiba-inu. 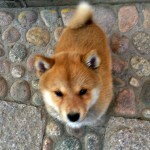 I lived in Japan during 1996-1997 when I taught English for the JET program and there were many Shiba-inus there. 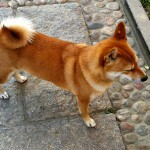 The name Shiba-Inu is a Nagano prefecture dialect word meaning “Little Brushwood Dog.” So, strangely enough, their name is actually redundant as it would be correctly translated from Japanese to English as “Shiba-dog” when it is obviously a dog. 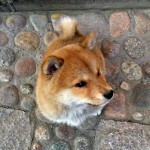 I am not sure of the Chinese name of this breed but I’m sure with a little google searching, someone can find out. I’m heading out for a 9 day vacation to Malaysia and Singapore so I don’t have the time to do it myself! 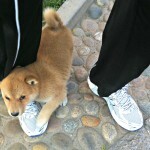 The puppy loving Jill’s sweatpants. Mama keeping watch of her baby. Mama is in full guard mode right now. Mama isn’t too interested in any humans right now. Her baby is what matters. Mama, puppy and their human.